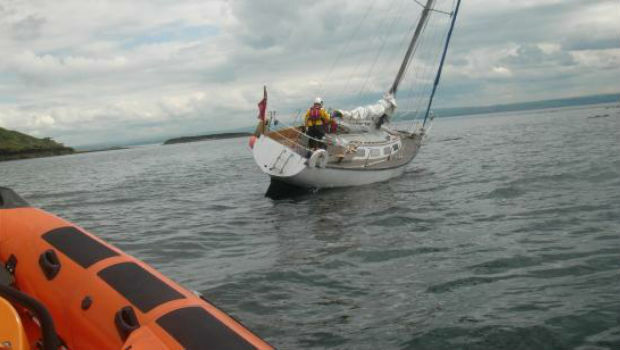 Kinghorn RNLI responded to an incident around 2pm yesterday where a 30ft yacht had struck rocks and run aground while trying to enter the harbour at Inchkeith Island. They were alerted from a group on the island who had witnessed the incident, via Aberdeen Coastguard. The yacht had a list of around 35° and the tide was still dropping. There was one person onboard and he was uninjured. The lifeboat crew arrived at the vessel around four minutes after launch and quickly assessed the situation and available options. The crew on this occasion were Scott McIlravie, Neil Chalmers, Robert Rutherford, and Henry Wibberley. The lifeboat was launched by shore crew members Dave Galloway and Steve Robinson. Kinghorn Lifeboat Station has a number of big events coming up. On Thursday 26th June the volunteer crew will carry the Queen’s Commonwealth Baton to Kirkcaldy harbour, and then final preparations will begin for the annual Open Day on Saturday 12th July, between Noon and 4pm. This is a great day out for the whole family with a number of attractions such as beach games and stalls, with the highlight being a rescue demonstration with the lifeboat and a military search and rescue helicopter (tbc). Poll: Should Scotland hold a second independence referendum?